Dog’s love our fresh grass dog litter. 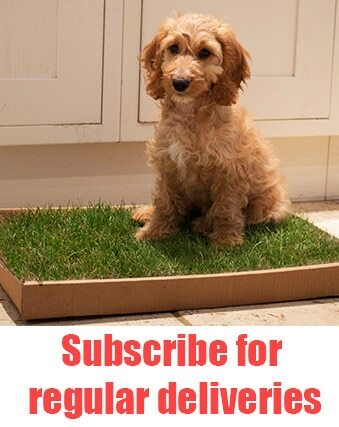 Grown in recycled textiles, instead of soil, Piddle Patch is a natural, mess-free dog toilet. Our grass is grown in the UK, harvested fresh to order, and delivered to you via a 24 hour courier. Fresh, soil-free grass, delivered direct to your door. 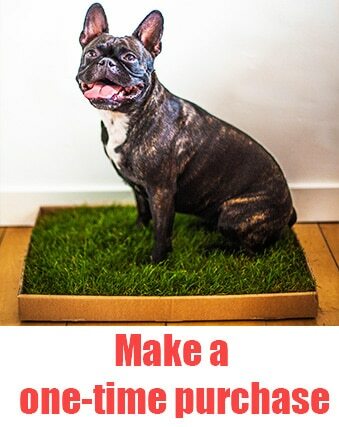 SKU: 111 Tags: Dog Litter, Fresh, Grass, Grass Litter, Soil-free, Turf. 5 out of 5	Very good for our 4th floor office! The Piddle Patch was great for George (a pug) when he was a young puppy. Our office is on the 4th floor and so it really helped us! Now George is 7 months old he has decided that vertical objects such as walls and lamp posts are more his thing, but up until now he regularly used the Piddle Patch. Great product. My dog loves to use the piddle patch. The fresh grass doesn’t smell like astro turf does after a few used. As I use it outdoors on a patio and find the real grass also doesn’t attract foxes. 5 out of 5	Regular Buyer! I love Piddlepatch! It’s worked really really well and my 6 year old Maltese prefers using it over puppy pads. There’s no seeping (even after 3 weeks) and the grass absorbs all waste and odours. My dog knew exactly what to do with it the moment it arrived, so no long training sessions necessary! I’m a regular buyer of this, it’s honestly made my life tons easier! 5 out of 5	Genius! Piddle patch has been a life saver! We live in an 8th floor flat with a balcony and can’t always get our puppy down and outside in time for the toilet. Piddle patch has helped teach him to go on the grass and given him somewhere nice to go on the balcony. His first Piddle Patch he didn’t take to – ripping it up daily; but after a couple of weeks of training he was using it happily! We purchased our first piddle patch on 9th October and although it’s now quite dead it could still be used, making them amazing value for money. Ordered another on 17th November and Rebecca was amazing with changing details on my order after I messed up my delivery address. Brilliant product and wonderful customer service. We will definitely be long term users of Piddle Patch! 5 out of 5	It works! Wilbur (mini daxie) realised straight away at 9 weeks old this was somewhere to pee.. First inside, and now out on my balcony. His preferred toilet spot, he is out and done in less than a minute. It seems to have helped him understand grass is the place to go despite being an urban dog! I find they last more than 2 weeks but maybe as using outside. I did have problems with him chewing the box for the first 1 or 2 but not any more.